Your brain activity (EEG) can be assessed by simply using this wireless EEG feedback unit (no wires to the computer)! The system includes the electronics, the active electrodes and the Bluetooth wireless transmitter. 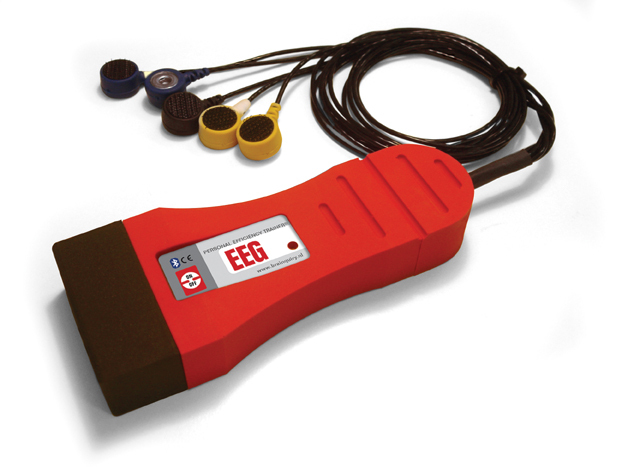 Due to our patented electronics, EEG can be assessed in a user friendly way and issues like impedance problems belong to the past. BioExplorer Software and Special Screens & Animations CD software (excellent for ADD/ADHD), are required for both the PET EEG system. Measuring or feeding back EEG activity can be used for sleep research, relaxation exercises, Neurofeedback, EEG Biofeedback or peak performance training. We supply high quality EEG hardware (low signal to noise ratios, high sampling rates: 200 Hz and higher), wireless capabilities and scalability. The scalability enables users to connect up to 8 devices to 1 single PC! BioExplorer is a software application that is often used for Neurofeedback training and psycho-physiological research. There are many different designs possible to train different parts of the brain and different modalities (EEG, ECG, EMG).